Japan and their knack for brevity, whew. I mean, I’m used to jdramas with a 10-episode count (sometimes even less!) but with around forty-five minutes for each episode. But Ito-kun A to E takes the cake by having ONLY eight episodes and less than 25 minutes of runtime per episode. The short length ensnared me into watching it right away but it was the first episode that made sure that I was going to finish it as soon as possible. Ito-kun A to E does not flounder nor waste time with unnecessary scenes. We were thrust immediately to the crux of the show and that is Yazaki Rio (Kimura Fumino), the scriptwriter of the acclaimed drama Tokyo Doll House, hasn’t written anything in four years. Her producer friend Tamura Shinya is pushing her to write again and to help her with that, the broadcasting/production company has organized a launch of her book on love advice and counseling. How can a book launch help her with writing, you might ask. Well, they had a gimmick where the launch attendees can ask and seek Yazaki’s help for their love woes and in this way, Yazaki can have inspiration for her next script. But the thing about Yazaki is that she actually looks down on these women. Having swore off love before, she thinks she’s above all these women who let men and love affect them as much. However, something interesting crops up after she goes through each letter to her and it’s that four women in the crowd are having problems because of a guy named Ito. She then meets these women to pick their brain and experiences to serve as inspiration for her writing, in the guise of giving them love advice. Who is this Ito guy in the first place? Is it the same Ito? WHO IS HE??? This was one of the core plots in this jdrama. I was wary how the show would present this premise because it felt kinda boring to just interview the ladies, showing the events in flashback, then Yazaki will comment after. So I was so mightily surprised and impressed when the writing and directing went with their choice and that was to include Yazaki in the flashback scenes as an omniscient commentator of sorts. Eating ramen with them whilst being completely invisible and unaware of all her comments and notes about their relationship. It was nifty and smart and I was already half in love with the show right then and there. With each lady interviewed, more information about this eponymous Ito were revealed and with that, a script for a new drama started taking shape. She writes one where a single guy named Ito is involved in all of these ladies’ lives. I absolutely applaud the writing in this show (although I don’t know if it should be attributed to the show’s writer or the author of the original novel it was adapted from) because everything was interwoven seamlessly. Like I said, there were no filler scenes and every single thing shown provided clues to how all these women are interconnected. Moreover, the mystery of who the heck was Ito also held the show together. But even if the identity of Ito was already known, it’s not like the viewer would lose interest in the show. 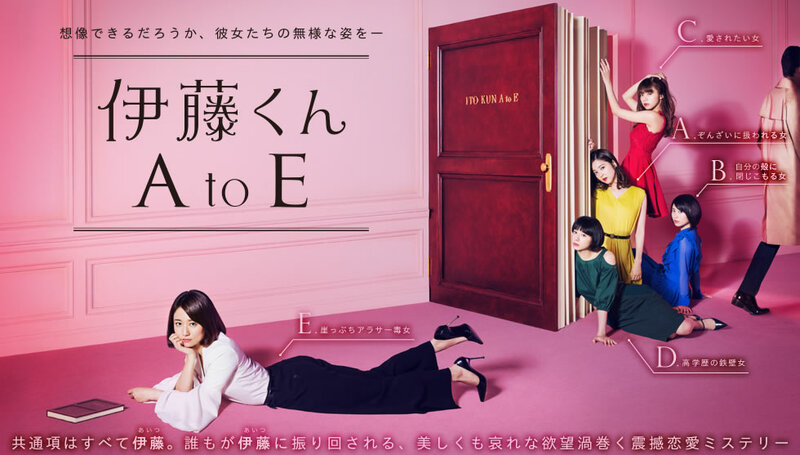 Ito-kun A to E was able to infiltrate my mind and my heart by making me invested in all these ladies and I wanted to know what happens to them. While the characterizations were not fully fleshed out, they were all human, with different life views and approaches, and I didn’t even notice it but I was rooting for them all. They were flawed and did actions that hurt people but I mean, who doesn’t? Aside from the tight storytelling, props should be given to the cast, especially Kimura Fumino as Yazaki. She WAS Yazaki Rio. She inhabited that role and made it her own. When I started watching Ito-kun A to E, I was wondering where have I seen this actress before because she looked familiar. I couldn’t place her so I googled her and found that she was the heroine in Boku Unmei no Hito desu and I couldn’t initially believe it. She lacked screen presence in there and she felt relegated to the shadows because of Kame and Pi’s bromantic chemistry. But in here she was fantastic and in her element. She was electric in here! In the end, what I loved best about this show is how by looking through the lives of these four ladies, Yazaki was able to look into herself and her own life and realize some things. For all the looking down she did on these women, it was clear to the audience that Yazaki has her own problems that she refused to face head-on. Her judgmental and slightly abrasive inner self was a hoot to watch though because she’s just so damn relatable and human. Because this is a Japanese drama and they excel in showing the little beats of humanity in us all, how flawed we are yet so ripe for growth, Ito-kun A to E had that expected dose of reality and introspection injected to it. It also made me look into myself and my own relationships. A show that can make you feel AND think? Will always sign up for that. Great drama right?! I just finished watching it! Is there actually going to be a movie sequel?! I hope so. Yes, it supposedly premiered back in January. I wanna see it soon! Hopefully within six months, the DVD is already available. Hi! I’ve watched both, the drama and the movie. I love the drama, it’s so original and interesting, but the movie was such a disappointment. I’ve waited the confrontation and the “special” relationship between Ito and the Lady E, but never happened. Ito is childish and immadure until the end and Rio doesn’t get the point, she seems so lost.